As some of you will know I champion the positive future for English and Welsh Wines and St David’s Day sees the launch of ukvine.com. James Graham, an experienced freelance journalist, is the man behind the idea. James has written for many of the key UK drinks publications and has been a keen supporter of the UK wine industry. ukvine.com will feature an ongoing range of trade articles, with some consumer focused pieces. Today sees the release of Absolute The Best of Scritti Politti on Rough Trade. Scritti were one of my favourite bands in the punk and post punk days, who hung out in a squat rather than tolerating rent. 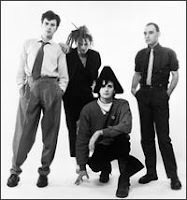 Tom Morley (second left in the pic) was the drummer in the early days until he left after Songs to Remember, Scritti’s first album. I ran into Tom around Paddington last year and he now owns Instant Teamwork. A good guy to catch up with and check out Scritti’s The Sweetest Girl from Songs to Remember. We need a summer, not just because you are all hoping to give the barbecue more of an airing this year than last and enjoy some super al fresco eating and drinking, but also because our English and Welsh winemakers need periods of continuous, consistent sunshine over the next few months. They need to ensure that 2013 is a harvest to remember, unlike 2012 which was dominated by wet and cool weather as we all know, resulting in producers making a lot less wine, although the quality was good. Perhaps surprising for you is the fact that, if everything goes to plan, in England and Wales this year around 7.5 million bottles of wine will be produced, up from 3 million bottles from the 2011 vintage! English and Welsh wines are rightly winning lots of accolades because we are making some of the best sparkling wines in the world here. Try these from producers like Nyetimber, Camel Valley, and Gusbourne Estate and, locally, Three Choirs in Newent. If you are looking for an easy drinking white then try Three Choirs Coleridge Hill or Willow Brook, both at around 11% abv. Alternatively, have a taste of the excellent Bacchus – the best white variety for quality still whites in England – from Brightwell Vineyard (pictured left) in Wallingford (to be featured at my Wine Talk & Tasting Evening at The Chipping Norton Theatre on Friday 17th May) or Bothy Vineyard. Whilst the majority of production in England and Wales is of sparkling and white wines, there are good pink fizzes and still rosés too, with a few reds produced by specialists like Strawberry Hill Vineyards in Newent who make Pinot Noir, Cabernet Sauvignon and Merlot. Other local producers worth a mention are Poulton Hill Estate in Cirencester and Bridewell wine available from in Wilcote near Chipping Norton. So if you haven’t tasted an English wine yet or visited an English vineyard, then you definitely should, and your best opportunity is coming up during English Wine Week which runs from Saturday May 25th until Sunday 2nd June. There will be lots of activities and promotions taking place and you will get to taste some excellent wines. More details are available from English Wine Producers or UKvine. "Neil has that rare gift of being able to put things over in a way anyone can appreciate, whether they knew much about wine previously or not, and his infectious enthusiasm is irresistible, taking the entire audience with him." "Neil is a charismatic presenter, with a great ability to synthesize the complexities of Spanish grapes, regions and tasting terms, and present them in a clear and engaging way." "Neil is a great addition to our celebrity chef demo theatre, bringing humour, expertise and entertainment to every session." "Neil is a great communicator who has mastered the Turf and the Vine - the passions of many. Champagne Laurent-Perrier are proud to work with Neil who acts as an independent advocate for our brand in the UK." Interested in booking The Wine Tipster for your event?